Santhome Public School is affiliated to Central Board of Secondary Education. It is owned and managed by Vishwadeepti Educational And Charitable Trust (Reg. No. E-22722.Mumbai). The members of this trust are Catholic Fathers belonging to the Missionary Society of St. Thomas The Apostle (MST). Formal education is one of our Missions. We believe in all round development of children, to inculcate the virtue of human dignity, equality and a sense of brotherhood in the young generation, which are the three icons of our democratic country. True glory is revealed in death for the sake of love. A single grain of the wheat falls into the ground and dies before it gives life to to many grains. Similar was the life of Saint Thomas who forsook himself and made his life a sacrifice. Love is to offer one's life for God and his children. This sacrificial love we intend to impart to our students. It is with this inspiration that we have chosen Saint Thomas as our patron. The school is run by catholic priests of The Missionary Society of St Thomas the Apostle through its registered trust, Vishwadeepti Educational and charitable Trust,in Mumbai, headed by a dedicated team aiming at evolving a new concept in community service by adding a new dimension to commitment in social, religious, cultural and educational activities, evoking a positive response to a new heritage. The Director General of the Missionary Society of St Thomas the Apostle,Very Rev. Dr. Kurian Ammanathukunnel MST is the founder and the chairman of the Trust. The school boasts of a vibrant,trained, dedicated and talented faculty equipped to deal with each and every aspect of a creative educational process. Each faculty member of Santhome Public School is both a teacher and a scholar, an expert in his or her own field. 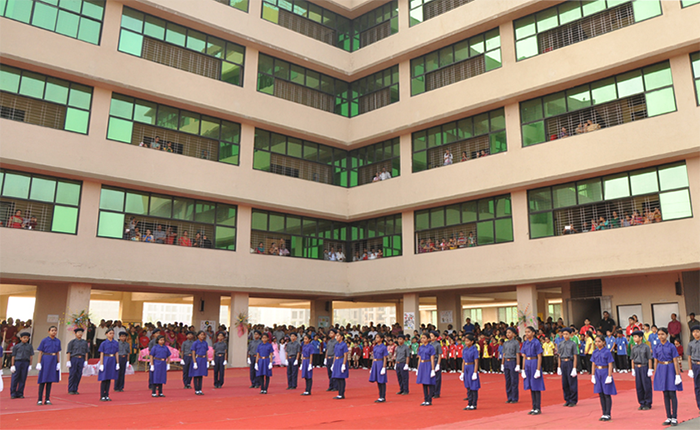 This academic community not only imparts education through regular periods in a classroom, but also engages students in a variety of ways during the various activities of the school. They have active membership along with students in various committees, editorial boards, clubs, school houses and supervise individual or group research projects. The opportunities for formal and informal realtionships with the Santhome faculty are plentiful and rewarding, resulting in life long friendships as well as professional mentorship that shape students lives and careers. Our tradition and culture believes that parents and guardians are a vital part of the equation when it comes to school success. Our school is filled with families like you who value the educational mission and appreciate the partnership between home and school. As a parent in our school, we hope you will find a meaningful way to be involved, share your talents and engage in the journey and joy of your child’s education. Our school’s Parent Teacher Association is always there to support the school with many community building and other social activities. As a whole PTA builds strong working relationships among parents, teachers and school, in support of students. Everyone has a role to play and actions speak louder than words, so the more people involved the more exciting and successful we can be. We would appreciate your talents and involvement!